MStereoSpread offers a novel take on stereo spreading, but getting the most out of it requires a reasoned approach. Great spectral algorithm. Fresh take on delay-based enhancement. Good manual. Fantastic saturation. No phasing bar. High CPU hit. MStereoSpread (VST/AU) is a 'spreading' plugin offering two discrete stereo widening algorithms operating in series. Preceding these is a master section with a useful mid/side widening control that changes the relative balance of the mono and stereo elements of the signal to widen (or narrow) it. "Spectral Generator splits the signal into a frequency bands that spread alternately left and right to create a natural stereo width"
The first of the two spreader algorithms is Spectral Generator, which splits the signal into an adjustable number of frequency bands spread alternately left and right to create a natural stereo width effect that shouldn't lose the punch of the signal. The more bands employed, the more natural the effect, but the CPU hit can get pretty serious as the number rises. Another side effect Melda warn of is that running a high number of bands causes phase- shifting, which can be problematic with certain types of material - particularly sounds with fast transients such as drums or anything with a piano-like envelope. The Focus control adjusts the distribution of the bands across the frequency spectrum and is best set away from the lower frequencies. There's also a useful left-right Invert button on both the spreader types and a global pan control that can be used to correct any left-right balance shifting that can occur, depending on the settings and the source material. The Min Frequency control (which also appears on the Delay-based Generator, which we'll discuss shortly) sets a low-frequency limit below which the algorithm has no effect. It's useful for leaving the extreme bass untouched (putting bass in stereo can reduce punch and introduce bass-cancellation). Next comes a superb Saturation algorithm that we've found ourselves using as much as the stereo tools! 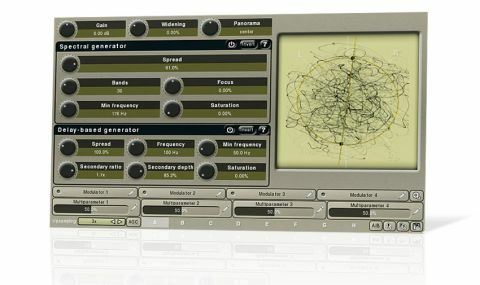 We tried the Spectral Generator on a wide range of material, from vocals to guitars and drums. While it can work well on all of them, the specific material has a big impact on the results, which can at times be too subtle, then jump quickly to unnatural, so it isn't useful on all signals. This requires some common sense and judicious A/B comparison. The second stereo process - Delay-Based Generator - is a more conventional comb filter-based delay that can sound harsh and ear-fatiguing if overused. MStereoSpread adds an additional feature to this otherwise rather unexciting section, though: a secondary delay of opposite polarity - handy for keeping the signal centered and sometimes enhancing the stereo effect, but sometimes sounding a little fierce. Then, to the right of the two main sections, the phase-scope lets you keep an eye out for any phasing issues, though it would be better if it included a more traditional phase bar/meter. Finally, there's Melda's trademark modulation section, although it doesn't produce particularly useful results in this plugin. If you want tremolo or evolving stereo effects, your other plugins will probably do a better job. While not quite as revolutionary-sounding as the manual might suggest, MStereoSpread does offer an effective take on the frequency- spreading concept, which can be useful on a variety of separate sound sources and even final mixes (used with great care!). The inclusion of a delay-based system makes this a well-rounded stereo spreader at a very attractive price.